In the first half of Terrence Malick’s career, he only made a handful of films, and now he seems to be churning them out every couple of years. For fans of his work, this may be good news, but the quality and thoughtfulness suffers with the speediness of each release. The stylistic concerns that have taken over his latest wave of films often take precedence over any attempt to write a well-constructed screenplay before starting filming, and the filmmaker’s improvisational style now mostly contains sequences of his actors doing nothing in the most self conscious way possible. It often feels as though Malick has placed a camera in front of the cast and told them to do something. This rarely ever feels natural, which seems to be the intention of improvisation in filmmaking, and instead results in a kind of contrived silliness that rarely resembles real human behavior. With that overriding criticism taken into consideration, Song to Song does have more thematic structure than the past few films by Malick. Even if it is still filled with numerous senselessly wispy scenes of actors prancing in front of the camera over ostentatiously prosaic voiceover, there is a clear narrative direction in the overstuffed film. By the end of the movie, we are clear about the theme, even if the approach is often either pretentiously poetic or unforgivably melodramatic. The theme of love and love lost is something that can be felt, even when the screenplay fails to give it the proper showcase. Much of what makes this particular film successful are the performances, even if the characters are often despicably underwritten and overshadowed by unnecessary subplots. At the center of the film is a romance between a pair of struggling songwriter/musicians in the Austin, Texas music scene. BV (Ryan Gosling) is wooed by a music producer named Cook (Michael Fassbender), and begins to work with him despite his bad reputation. While at one of his parties, BV meets another young songwriter named Faye (Rooney Mara) and the two almost immediately hit it off. They begin dating each other, with Cook tagging along as the third wheel. The only problem with this arrangement is that Faye is secretly sleeping with Cook in hopes that it will propel her career, making her an instantly detestable character. 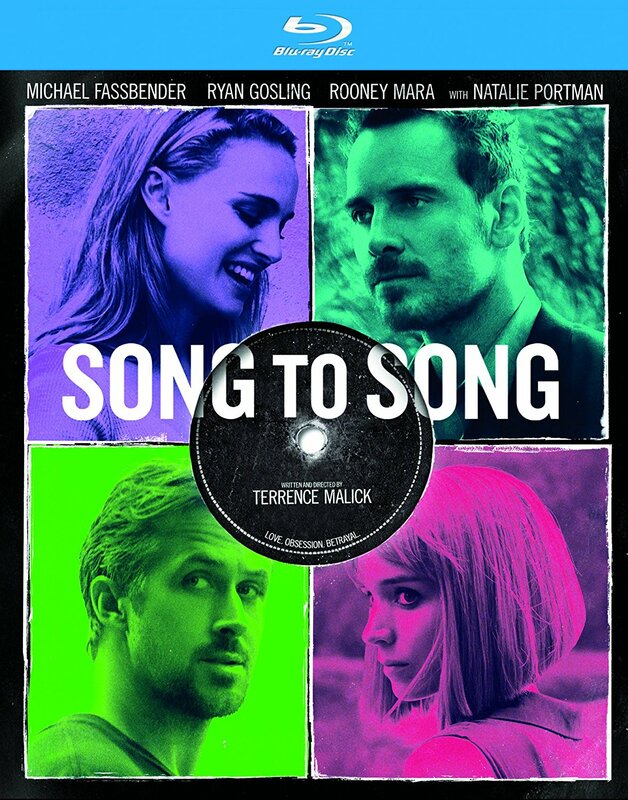 Had the film chosen to remain focused on this love triangle, perhaps working a little harder to justify the selfish and hurtful actions of Faye, Song to Song could have been a great film, or at least a clear and concise one. Instead, we are given the distraction of countless other relationships, as Malick makes another film with a revolving door of beautiful young actresses, each seeming to have little purpose other than giving the director something to navel gaze at. I mean that literally. There are endless scenes of the camera simply lingering on the tight young bodies of attractive actresses in the throes of foreplay, all of which have very similar appearances we must assume are Malick’s type. At over two hours long, far too much of Song to Song feels distracted by a pervy old man’s libido. While most filmmakers may have been content with a love triangle, Song to Song gives each of the three main characters their own secondary love story, which often feels distractingly unnecessary. At the same time that Cook is sleeping with his friend and co-worker’s girlfriend, he begins his own relationship with a waitress named Rhonda (Natalie Portman), who he seduces with nice cars and clothes. Rhonda initially seems to be one of the few sincere personalities in the film, until her preoccupation with Cook’s wealth corrupts her into distasteful behavior as well. Cook’s main purpose in the film seems to be corruption, filling the screen time with numerous threesomes that again feel like the filmmaker living vicariously through his attractive young cast members. The problem with these flawed characters is that Malick never gives us enough development or reason to justify their actions. They mostly just come off as superficial and unlikable, with Gosling’s BV being a slight exception. As the only one reacting like a human being with normal emotions and average morality, when BV discovers the web of lies that Cook and Faye have been feeding him, he breaks it off with both of them. BV seems to be the only character in Malick’s film able to withstand the temptation of Cook’s wealth, even if he simply runs to another wealthy partner once discovering the betrayal. BV begins to date a wealthy woman named Amanda (Cate Blanchett), giving Malick even more reason to preoccupy his camera with the excess of wealth that has filled much of his recent cinematography, while Faye has a lesbian affair that allows him to fill his frame with his other obvious interest. Anybody who has watched a Malick film in the last five years won’t be surprised by the meandering nature of his filmmaking, or by what he chooses to point his camera at, but they might be surprised by how little music a movie about the music industry actually contains. It almost feels as if Malick’s primary reason for setting the movie in the music scene to begin with was merely an excuse to fill the film with silly cameos that often just distract from the main narrative. And despite shooting this before La La Land was made, it doesn’t help to have Gosling’s musical talents go widely underutilized shortly after audiences had the chance to see him thrive under Damien Chazelle’s direction. In short, Song to Song is the best film Malick has made since Tree of Life, but it still comes nowhere close to the quality of his earlier films. The Blu-ray release comes with few bells and whistles. There is no digital copy, no DVD, and only one special feature. Ironically, that extra is a featurette about the music in the film, despite it playing such a small role.